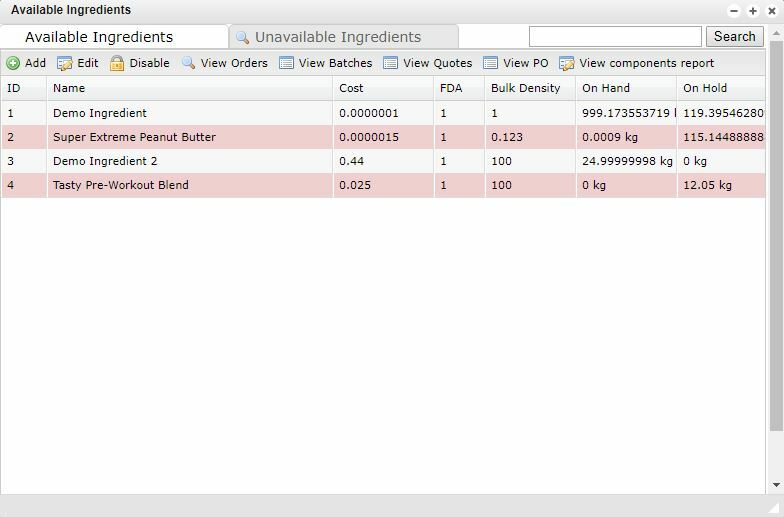 The Ingredients window allows you to see all ingredients that are currently available or unavailable within your system. These entries can be sorted by their unique ID, ingredient name, cost, bulk density, on hand amount, on hold amount and much more. This window is beneficial when searching for orders, batches, quotes and purchase orders that contain a specific ingredient. From the Ingredients window, you have 2 tab options at the top of the page, Available Ingredients and Unavailable Ingredients. The Unavailable Ingredients tab allows you to view all ingredients that are in the system but are currently unavailable. This allows you to determine if a purchase order needs to be created to replenish needed ingredients that may be required to complete an upcoming formula.